Yom HaShoah or Holocaust Remembrance Day 2014: Here is the history and top 10 heart-wrenching facts associated with the Holocaust Memorial Day. Yom HaShoah, also known as the 'Remembrance Day for the Holocaust and Heroism', is a Jewish observance, considered as an occasion to commemorate the lives of the six million Jews who lost their lives in the Holocaust, between 1933 and 1945. Usually observed on the 27th day of the Nisan, the first month of the ecclesiastical year in the Jewish calendar, the day is a national memorial day in Israel. This year, the day falls on 28 April. Many countries across the world also dedicate this day in remembrance of the six million Jews killed in the Holocaust. 1. The most important reasoning that led Adolf Hitler execute so many people in the Holocaust, was his obsession with the idea of 'racial hygiene' - the believe that it was possible to create a 'pure' German race by selective breeding techniques applied in agriculture. 2. Among those Adolf Hitler and the National Socialist German Workers Party wanted to eliminate were Jewish people, the Roma; certain groups from Poland and Russia; Jehovah's Witnesses, homosexuals, disabled people, and communists. 3. The systematic removal and elimination of Jewish people from German society was referred to as the "Final Solution to the Jewish Question". 4. Among the 11 million people who died mainly in death and concentration camps, six million were Jewish. 5. The total number of Jewish people that died represented almost one-third of all Jewish people alive at that time. 6. Two-thirds of Jewish people living in Europe at the time of World War II were killed by Nazis. 7. Among the 11 million people killed during the Holocuast, 1.1 million were children. 8. There were thousands of Nazi concentration camps and sub-camps during the Holocaust. A well known camp is called Auschwitz/Birkenau which is located in Poland. 9. When World War II began, Jews were forced to wear a yellow Star of David with the word 'Jude' written on it so that Nazi's and others could identify them. 10. Jewish people were forced to live in degrading areas of the city called ghettos after WWII began. 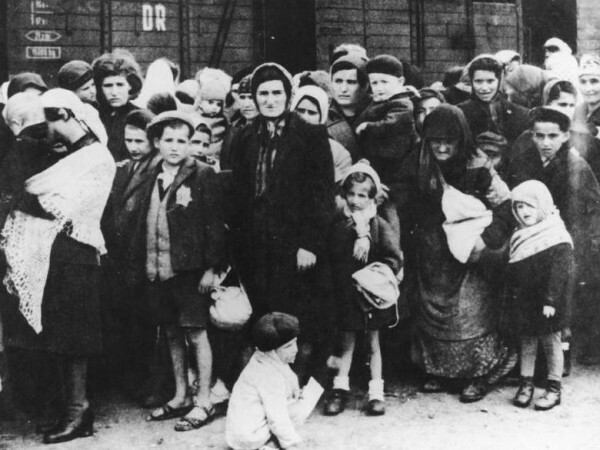 In the larger ghettos, up to 1000 people were picked up and brought by train to concentration camps or death camps. 11. In order to get the Jewish people to cooperate with the Nazis they said that they were being transported for different labour. 12. One of the first concentration camps was known as Dachau. 13. Auschwitz was the largest concentration camp. 14. The Nazis reportedly had six extermination camps - where they would exterminate the Jewish people. 15. The Holocaust in Hebrew is called the Shoah, which means catastrophe. 16. The Nazis and their helpers used the most horrible and terrifying methods of murdering Jews and others. Different methods of mass murder were tested. They began by using mass shooting, then used gassing trucks and ultimately build large industrialised facilities of mass destruction as in Auschwitz-Birkenau, where the highly effective Zyklon B gas was used to suffocate and kill Jews. 17. The first victims of the Holocaust were people with disabilities. 18. Holocaust Remembrance Day marks the liberation of the Auschwitz-Birkenau death camps in 1945. 19. There are still some people in the world who feel the Holocuast never existed. 20. More than 500,000 people visit the Auschwitz concentration camp every year.